Today (2-26-2012) I dropped by the Starbucks at Fourth and Union in downtown Seattle and hoped to be able to do a quick coffee tasting. This was spontaneous. I didn’t know who would be working and I didn’t know if they’d be too busy. A little over one week ago, a partner in Canada (who had just been on a vacation to Mexico) mailed me a bag of Starbucks Colombia whole bean coffee. I drooled when I got it. Colombia is still a core coffee in a number of the international Starbucks markets. Since I had never had the opportunity to taste and compare Colombia Via side by side with Colombia whole bean core coffee, I thought that might work as a quick and fun coffee tasting. Three partners were there working on this Sunday morning Starbucks visit: Helen, Aaron, and Jenny were all very interested in trying a quick coffee tasting. It was a Sunday morning, and luckily, I seemed to time this with a slower moment in the store. Aaron told me that he wants to start his coffee master training, and that he is really interested in getting more coffee tasting experience. He made a French press of the Colombia and prepared everything. I have to say we loved the Colombia whole bean coffee. Aaron and I were totally impressed with the beautiful nutty flavor, and the smooth texture, and light cocoa notes too. This is a near perfect cup of coffee. Aaron commented that he liked it just slightly better than the Guatamela Antigua which had been a favorite core coffee of his. The Colombia Via Ready Brew was also quite good, and held its own quite well. I could detect some nuttiness to it, though it lacked the beautiful aroma found in the whole bean version. Suddenly I did appreciate the Colombia Via more than I had before, and bought a pack of it to take home. Although I like darker coffees, I really do enjoy a nice ‘medium’ roast too, and the Colombia is definitely that. The Roast You Love the Most media event – (Food pairing) This was a coffee tasting that I went to at Olive Way Starbucks, and it was produced by Olive Way and the Starbucks PR department. I was there with a number of other local bloggers. 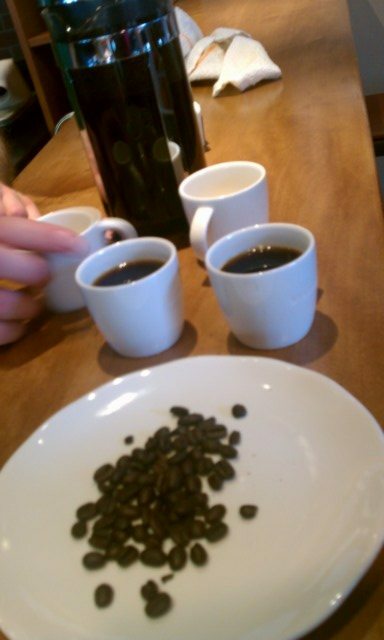 This was a superbly well thought out coffee tasting of Veranda, Pike Place Roast, and Italian. Anton at Olive Way is really good at putting on highly professional coffee events! Ethiopia Hararr, Aged Sumatra, and more – (Food pairing) This was one of the regularly scheduled Olive Way coffee tasting events. This again was an extremely professional, well thought out coffee tasting. The Hararr was paired with the raisins from the Perfect Oatmeal, and that turned out to be a superb choice. I hope you’ll read this one too! The “butter” coffee tasting: Anniversary Blend – (Food pairing) This was a unique opportunity to try Anniversary Blend with some butter. It really demonstrates some unusual things you can do to learn about, and try coffee. Mikey (also known as “Mr. Opportunity” – Just look at the window cling) put on a world-class tasting. A barista earns her black apron – Christmas Blend, Pike Place Roast, and two Reserve coffees – (Food pairing) This was a coffee tasting event at the 6th and Union Starbucks (in downtown Seattle) produced by a barista earning her black apron. It was a really fun event featuring four coffees, and especially great to see a partner given her black apron! Casi Cielo coffee tasting at Olive Way – (Food pairing) This was one of the regularly scheduled Olive Way coffee tasting events. Absolutely wonderful food pairings with Casi Cielo. This store really has a knack for professional coffee events. 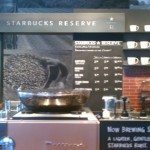 Bali Blend and core Starbucks Sumatra coffee – (Taste and compare) This was another one of my spontaneous moments where I dropped by my neighborhood Starbucks (7th and Pike), and wondered if the partners wanted to try one of the rare international coffees – Bali Blend. 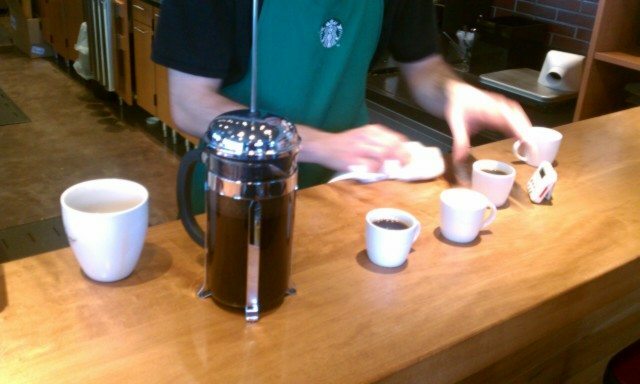 This was a very classic, “taste and compare” style event, and we compared Bali Blend with the core Sumatra coffee at Starbucks. Really a fantastic fun quick tasting. Coffee tasting: Cupping Mexico blend – (Cupping) Mexico Blend is one of the international Starbucks coffee, and at this event we did a traditional “cupping” which is the coffee tasting method used by roasters to check for coffee quality. It’s actually difficult to find a cupping at a Starbucks because most stores are not set up to do them. Although this is a very old blog article, I thought I’d shine a spotlight on it too. Galapogas Island Roasting event – This was not a coffee tasting really, but I wanted to mention this too. There are regular roasting events at the Starbucks headquarters, and this was one of the very few times that I had the chance to go to one. It was just a heck of a lot of fun, and something that I still look back very fondly on, and thankful that I had this opportunity. Three Region Blend and plums – (Food pairing) I asked two coffee masters at the First and Pike Starbucks to help me out in figuring out a way to feature Three Region Blend in a coffee tasting. 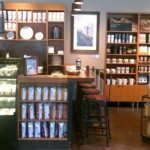 This is a really old blog post, and those partners aren’t even at that store anymore (I think they’re both still partners, just at different stores) but what they came up with was an incredibly superb selection of foods that highlight the best flavors of Three Region Blend. Those two partners (Heidi and Jeremy) are true lovers of the bean, and have a natural knack for coffee tastings. Sumatra Lake Toba – (Cupping) – A quick cupping event at 15th Avenue Coffee and Tea Starbucks featuring Sumatra Lake Toba coffee. Organic Blue Java and a donut – (Food pairing) – This was an incredibly fast coffee tasting of Blue Java with a donut. I just dropped by the First and Pike Starbucks, and caught up with Emily who radiates tons of passion for Starbucks. She’s still a partner, just a different store now. 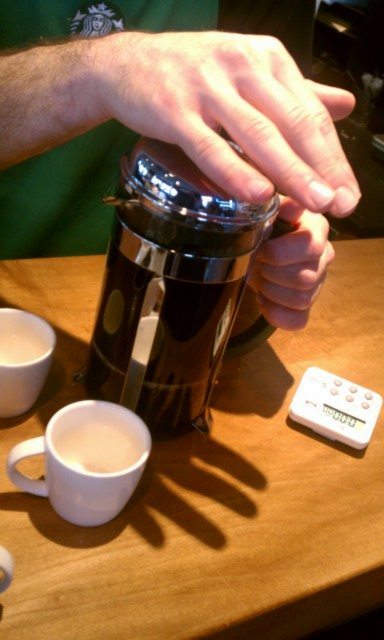 This is a really old blog post, but it shows how you can do a coffee tasting on the fly! 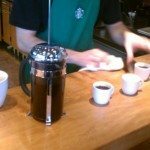 Breakfast Blend Via compared with Breakfast Blend whole bean – (Cupping) – I dropped by 15th Avenue Coffee and Tea Starbucks, which in the past has had regularly scheduled coffee events. I suggested the idea of comparing a Via with its whole bean counterpart, and Amanda (who is an incredibly knowledgeable barista, and since then has been promoted in the headquarters) ran with the idea, and she set up this cupping. 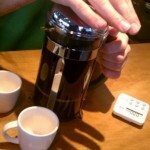 There are more coffee tastings on this blog, but I think I’ll stop right there. By the way, I mentally categorize coffee events into three categories: Cuppings, Food Pairings, and Taste and Compare. This is NOT an official Starbucks categorization, but it seems to work for me to describe the most common ways to learn about coffee. And, I am of the opinion that to learn the most about coffee, one should experience all three of these. I am having some computer problems at the moment, and so I’m just using whatever computer I can right now. I took these photos (from today’s Colombia tasting) on my phone on a low resolution setting so that I wouldn’t have to use a photo editor to re-size them. Sorry that they’re not great quality. Thank you again Aaron and everyone at the Fourth and Union Starbucks for a great quick tasting! NEW: Starbucks Spring Blend Coffee. 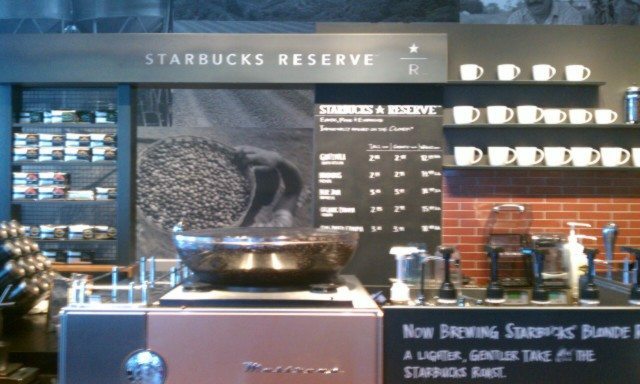 Sulawesi Coffee Coming to Starbucks Everywhere! Hi Mel!!! Speaking of tasting… I received an email from Starbucks this week offering a free cute little tasting cup if I placed an order from a selct group of coffees. Much to my dismay, the Kcups were not offered! Dang it… I already have one tasting cup and they work nicely for shot glasses as well Another fav are the Via’s as they pack nicely for travel and lunchpails/desk drawers; those were not one of the selcet either… Booo! I will keep watch and maybe another special will pop up soon! When I saw the photo of the Columbia whole bean before I read the article I said “What is that!” (yes, out loud) I haven’t tasted Columbia coffee but I have to be honest and say that I do not care for the Columbia VIA. I find it has a very strange smell and an odd aftertaste. I much prefer the Italian VIA to the Columbia. I’ll be honest and admit that when the French Roast VIA came out I was on vacation and so I missed the required pre-launch tasting, and somehow I’ve managed to get by without ever tasting it. Since all the French Presses in my store are broken (yes…all!) I think I will have my partners go through the VIA spectrum this week until our new ones arrive in our order Thursday. Wow, extensive and informative! I love Starbucks coffee but never really had to time to try most of their brews. I’m so glad to have read this — I’m pretty sure you just saved me load of hours researching it on my own. Thanks, Mel! I feel I need to try the Columbia – I don’t think I’ve tried that one yet. 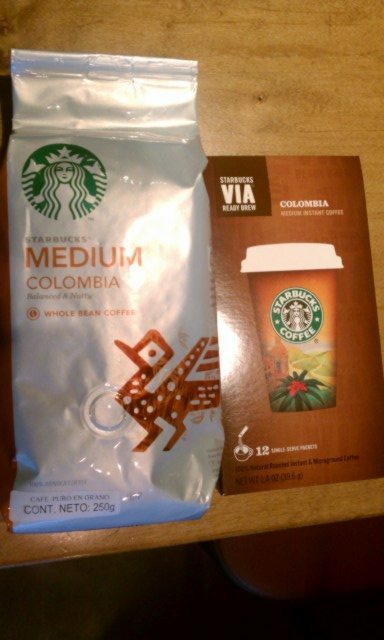 @darkkatpouncing – This Colombia coffee is only an international Starbucks offering – Which is a disappointment to me. The Reserve Guatemala Antigua Santa Catalina is wonderfully smooth and nice and is a superb medium option. I didn’t realize that Columbia wasn’t a US whole bean…I feel unobservant. I guess I assumed it was the house blend. Wow. Thanks for this post!! I still have to say I do sort of like the simplicity and clean design of the bags! you know, i would love to do some side by side comparisons of my own like this! The only two I’ve compared are Christmas Blend and Christmas Blend VIA, but never to this level of detail. Mainly, I’ve bought the VIA to stretch my Christmas Blend into the spring — I prefer the whole bean but still enjoy the VIA. Thanks for the comparison! @eric – I guess we can do this again soon when Tribute Blend comes around. 😉 By the way, do you follow me on twitter? @Elly – Maybe Olive Way would want to experiment with Via in their tastings, and I even kind of like that idea, but they do such incredibly superb tastings now, not sure I want to change a thing! 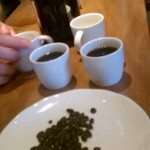 It’s interesting that you wrote about a tasting comparison of the Colombia next to the VIA. I led a coffee seminar over the summer, offering comparisons between all of our VIA and the whole bean counterpart. It was AMAZING. Some of the participants ended up choosing the VIA over the whole bean! @Dustin – Now that would be an interesting taste comparison. With House and BB as Via, that could be a long tasting but those are hard to find! Supposedly they’re in grocery stores but many stores around here just don’t have them. Very difficult to hunt down. By the way, does your market have decaf Verona Via Ready Brew? I’m confused by the pamphlets in stores that say, “Starbucks Roast Spectrum” and list decaf Verona as a Via option. Did Starbucks name the coffee after the name of the building or did they name the building after the name of the coffee? @Adel – Not sure I follow. Colombia coffee comes from the country in Latin America – Colombia, It is spelled with two Os and no U. In Seattle, we do have the “Columbia Tower” which has the “U” and the name of the building has nothing to do with this coffee. In any case, the Columbia Tower has had a couple of different names too – I think it was once the Bank of America Tower. It used to be that most Starbucks coffees were named after a coffee growin region – And if you look at the Reserve coffees, those all have the name of the region where the coffee was grown in the name. Does that help? An interesting post. You see, I also had my first taste of whole bean colombia coffee and I love it for the same reasons you mentioned here. Terrific post Melody. Love the fact that the partners were so willing to do the tastings and spend time with you. Liked reading about the comparison of the via vs. whole bean. I can pretty much tell you partners around here would not be as accomodating. Seems like ages since I have had Columbia. I have always wondered why it was discontinued. It sold well in the stores I was at. Perhaps there were just too many medium whole bean coffees that they wanted to trim it down to prevent waste. My dad adores the Columbia Via, so I wish we had the whole bean to surprise him with. Great post, Melody. I love Christmas Blend Via but haven’t tried many of the others. Once my stash of CB Via runs out I was wondering which other Via would be a good stand in until the next holiday season? Considering the Colombia is a medium roast, I think the roasters have done a fantastic job in creating what I see as a delicate roast in order to bring out such nutty flavours. They timed it just right. Once I had so many sachets of the VIA Colombia after a media event in London, that on the train home back from London, on a virgin train service, I asked the cabin manager if I could do a coffee tasting, and I thought she’s bound to say no – but she didn’t. She actually agreed, and let me sample the coffee ( using their hot water on board ) and I did a coffee tasting with over 80 passengers. That was a day to remember for me I tell you !! I’m now eagerly awaiting the arrival of our new Blonde Roast which is sure to be a huge success to all those coffee drinkers who prefer a lighter coffee with some tangy and bright notes. Mel, thank you for all you do, for your honesty, transparency and genuine loyalty. There needs to be tastings outside of Seattle and the other urban areas and out in the suburbs. More people should be exposed to the rest of the Starbucks menu. Thanks for the suggestion, Melody. I look forward to trying the Tribute Via. Having the stores do tastings between Via and their whole bean counterpart is a great idea. I do tastings in Arizona. (: My new manager plans to certify me as a coffee master soon. I need to reread the materials and brush up for certification. Very excited to share my passion and knowledge at a new store. I wish the online store offered international offerings! Although I’m more of a bold drinker, I love this coffee for the same reasons you’ve said. One thing I’ve been wondering though, does anyone know if this is the same coffee as the Colombia Narino Supremo from way back? Did they just change the name, or the coffee too? To me it tastes the same. If anyone knows for sure that’d be great. @diele we need more of you here in AZ! @Hayley and @Nathan – In some twitter conversation, I think Jonathan (starbucks_rcm) mentioned to me that the two colombia coffees are the same. Hopefully he’ll come back here to the blog – He is a coffee expert! My wife and I saw Columbia whole bean coffee at the supermarket tonight. Given that its not sold at Starbucks stores here in the US, I was really surprised to see it at the supermarket. I’m glad you posted your find at the supermarket, Jared. I found the Colombia whole bean coffee here in Indiana at a Kroger grocery store a couple of days ago. Very same bag that Melody has pictured and that’s what caught my eye. It’s in whole bean form at this grocery and in ground form (same bag) across the street at Walmart. @Jared and @BeckyE – That’s amazing that this coffee is in grocery stores. I’ve totally missed that. Thank you for telling me! It’s such a shame that it is pre-ground!!! Ugh! In any case, I do a lot of my shopping at Whole Foods which doesn’t have Starbucks coffees or Via, but now I am going to be on the look out for this coffee. Melody, I do not know if you have found any Colombia closer to home, but I saw some yesterday in Bellevue, WA. The Target in the Factoria shopping center had bagged, pre-ground Colombia in a Starbucks display. Maybe all Targets in the area carry this? @Laura – Thanks for the info. I wish they had the Colombia in whole bean. I do most of my grocery shopping at the Whole Foods nearest to home (the one on Westlake) and WF doesn’t carry any Starbucks coffee! I’ve always found that a bit disappointing. I’ll keep looking. I might have to make a trip to Factoria. 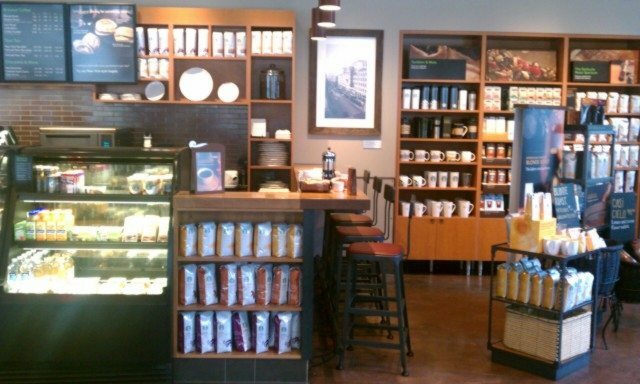 I’ve been meaning to get to the Loehmann’s Plaza Starbucks in Factoria. I’ve been buying Starbucks Columbia Medium whole bean at Publix grocery stores in Florida for many years. Last week I went to stock up on a few bags and they only had the pre-ground (ugh) Columbia on the shelf and no section for the whole bean. What’s going on? Has it been discontinued? I’m hooked on Columbia whole bean and need my coffee fix every morning. I’ve tried a few other flavors, but nothing compares to the taste of Columbia whole bean freshly ground coffee to start my day. Dave – we are having the same problem in the Chicago area. We can only find ground. Did you find anything out?